The 1997 Tony Award-winning Best Musical, Titanic, is being launched again in a new, intimate production and has docked at Westchester Broadway Theatre in Elmsford, N.Y., direct from rave reviews in London. It is scheduled to run until Feb. 23, then steams toward Toronto before a Broadway berth. On press night, composer Maury Yeston was in attendance at the venerable dinner theater, where the menu features four entrees served on the great ship and a wine/rum punch named after the White Star line. Yeston’s score won a Tony, as did the late Peter Stone’s book, Jonathan Tunick’s orchestrations, Stewart Laing’s scenic design and the musical itself. 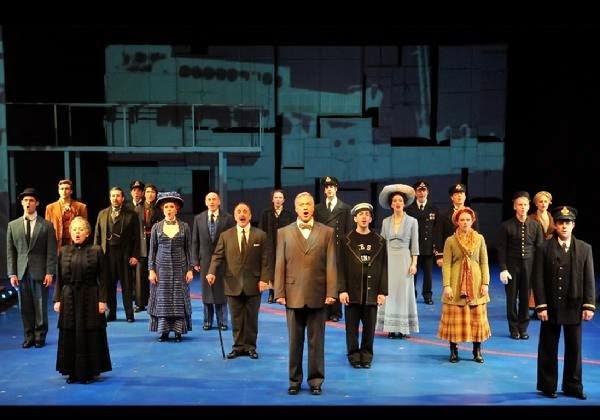 Without special effects (apart from the projections) or large set pieces, this Titanic focuses on relationships ... To read the rest of this review, please click here: allaboutarmonk.